We use Vivax-Metrotech locators to safely find and mark out buried utilities, locate manholes that have been buried by snow or dirt, and then map them out for you. Need to find buried utilities? What to confirm just where that tank is before you probe a hole? What to ensure the well location is clear to drill? Let us generate detailed subsurface infrastructure maps using GPS and advanced data processing software so you can take confidence in future site investigation efforts. Kodiak uses GPR to help identify buried pipes, tanks, vaults and multiple types of utility lines. Fast, effective, non-instrusive and safe. Combine our locating services with our air knife services and the normal 1- Call process to complete the industry standard "Triad of Safety". Our Vacmaster System 4000 will safely and effectively pre-clear boreholes and well locations, uncovering buried lines and pipes lowering the chance to drill or probe into them and cause serious damage. Why air? Air compresses and flows around a buried utility, unlike water which slices and damages. Air finds its way into even the smallest pore spaces, exploding and loosening, all to be quickly vac'd and removed exposing any potential trouble. Vac out and clean your carbon units, oil-water separators, mud pits, and valve boxes. Need a storm water vault or drop box cleaned out after a long winter? Use the power of air to ensure your projects are completed safely! 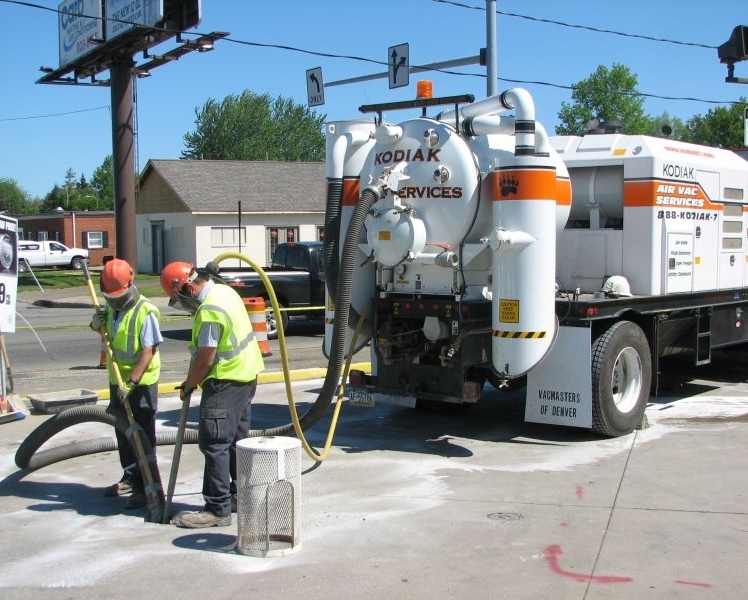 Kodiak uses one of the largest soft dig units on the market to safely and efficiently blast and remove soil from the ground without risking damage to buried lines or structures.